A dynamic Professional tabla player with good aesthetic sense and over 40 years of experience in playing tabla and composing music. Name of Gurus: Late Pandit Kanai Dutta, Pandit Sanjoy Mukherjee and Pandit Sankha Chatterjee. Gradation in Air: A grade on Tabla from All India Radio, Kolkata. National Scholarship Received National Scholarship from ICCR. And Talmoni from Sur Singer Samsad, Mumbai. CD : 1) Paris –Delhi – Bombay – by Centre Pompidou, Paris. Tabla Solo and accompaniment with Saranghi, Sitar. And other tracks of Pt Ravi Shankar, Bhimsen Joshi, Begum Akhtar and Ustad Bismillah Khan. 7) Night in the Mountain--- Clic Music, Brussels. 8 ) Twilight-- Bihan Music Kolkata. 10) Ratidhwani - On Sitar Rohan Dasgupta . 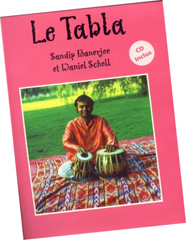 Tabla: Sandip Banerjee. Released in May 2015 . Concerts played: Sangeet Research Academy, Dover lane, Uttorpara Sangeet Chakra ,Tansen, Saptak, Harballav , West Bengal Rajjya Sangeet Academy. Sangeet Natak Academy, New Delhi, etc. Video on you tube YouTube id-- sandipbanerjeetabla. Please check on my website under Projects with some video links. 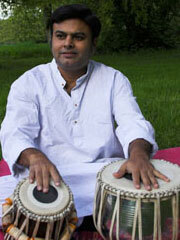 Sandip's father recognized his son's natural talent and ability at a very early age. He carefully inspired and encouraged him to begin his 'Riaj' (study) on tabla drums, at the tender age of 7, under the premier tabaliya (tabla player) of his time the Late Pandit Kanai Dutta of the Farukabad Gharana (school). 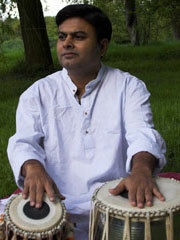 For 5 years Sandip flourished in the great tabla maestro's care until his untimely death in 1977. Devastated but determined to continue riaj, Sandip and his father turned to another of their gharana's eminent tabaliya Pandit Sanjoy Mukherjee. Under his new Guru's (teacher's) guidance and after years of intensive 'sadhana' (practice), Sandip was awarded 'National Scholarship' from the Government of India in 1992 and in 1997 he completed 20 years of advanced training under his Guru Pandit Sanjoy Mukherjee. 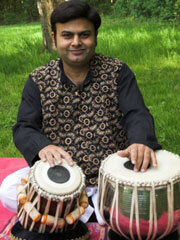 In the Indian tradition of lifetime 'Sadhana' and aesthetic improvement and being dedicated to mastering even the most subtle nuances of the tabla (rhythm), he has received specialized training from the renowned tabaliya Pandit Shankha Chatterjee, senior disciple of Late Ustad Keramotulla Khan and great Late Ustad Allarakha Khan Sahib. 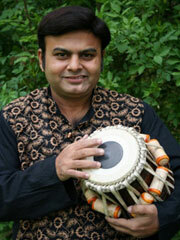 Sandip's good taste and even temperament are reflected in his solid soulful style of playing. In India he is well known for his graceful accompaniment and with his powerful adept solo performance He appears regularly on T.V. and Radio as Grade A artist of All India Radio, Kolkata. 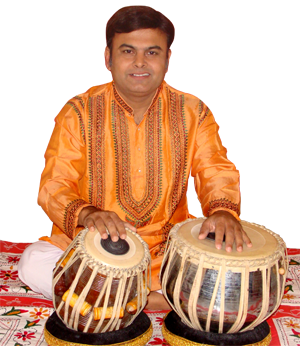 He has accompanied on Tabla with country's top recording artists such as Sitarist Pandit Budhaditya Mukherjee, Pandit Kushal Das,Sarodist Pandit Tejendranarayan Mazumdar, Guitarist Pandit Barun Kumar Pal, Sitarist Pandit Monilal Nag, Sehenaist Ustad Ali Ahmed Hussain. .He is enlisted artist of ICCR. Included in his demanding schedule are frequent trips to abroad, to perform, lecture and conduct his popular drum workshops. His ability to communicate and his common sense approach to teaching and performing this art, win him many enthusiastic students and admirers everywhere he travels.He has played many wellknown festicals in India like Saptak, Tansen, Doverlane, Uttarpara Sangeet chakra, ITC Sangeet Sammelan at Kolkata, Bijapore music Festival etc. A rare combination of talent, dedication and good sensibilities have brought Sandip to the top of his art. Such rare qualities have made him a much sought after performer and teacher both in India and abroad. Lovers of Indian Classical music around the world will continue to be enthralled by this first class mature and powerful performing artist now and in the years to come. UPCOMING EUROPE TOUR FROM APRIL TO JUNE 2018; I SHALL BE IN EUROPE THAT TME FOR DIFFERENT CONCERTS WITH DIFFERENT ARTISTS. IN APRIL TOURING WITH VERY GOOD SITARIST KALYANKIT DAS, SON OF PANDIT KUSHAL DAS.